"Temples" redirects here. For the English rock band, see Temples (band). For other uses, see Temple (disambiguation). The form and function of temples is thus very variable, though they are often considered by believers to be in some sense the "house" of one or more deities. Typically offerings of some sort are made to the deity, and other rituals enacted, and a special group of clergy maintain, and operate the temple. The degree to which the whole population of believers can access the building varies significantly; often parts or even the whole main building can only be accessed by the clergy. Temples typically have a main building and a larger precinct, which may contain many other buildings, or may be a dome shaped structure, much like an igloo. The word comes from Ancient Rome, where a templum constituted a sacred precinct as defined by a priest, or augur. It has the same root as the word "template", a plan in preparation of the building that was marked out on the ground by the augur. Templa also became associated with the dwelling places of a god or gods. Despite the specific set of meanings associated with the word, it has now become widely used to describe a house of worship for any number of religions and is even used for time periods prior to the Romans. The temple-building tradition of Mesopotamia derived from the cults of gods and deities in the Mesopotamian religion. It spanned several civilizations; from Sumerian, Akkadian, Assyrian, and Babylonian. The most common temple architecture of Mesopotamia is the structure of sun-baked bricks called a Ziggurat, having the form of a terraced step pyramid with a flat upper terrace where the shrine or temple stood. A god's presence in the temple linked the human and divine realms and allowed humans to interact with the god through ritual. These rituals, it was believed, sustained the god and allowed it to continue to play its proper role in nature. They were therefore a key part of the maintenance of maat, the ideal order of nature and of human society in Egyptian belief. Maintaining maat was the entire purpose of Egyptian religion, and thus it was the purpose of a temple as well. Ancient Egyptian temples were also of economic significance to Egyptian society. The temples stored and redistributed grain and came to own large portions of the nation's arable land (some estimate as much as 33% by the New Kingdom period). In addition, many of these Egyptian temples utilized the Tripartite Floor Plan in order to draw visitors to the center room. Though today we call most Greek religious buildings "temples," the ancient Greeks would have referred to a temenos, or sacred precinct. Its sacredness, often connected with a holy grove, was more important than the building itself, as it contained the open air altar on which the sacrifices were made. The building which housed the cult statue in its naos was originally a rather simple structure, but by the middle of the 6th century BCE had become increasingly elaborate. Greek temple architecture had a profound influence on ancient architectural traditions. The rituals that located and sited Roman temples were performed by an augur through the observation of the flight of birds or other natural phenomenon. Roman temples usually faced east or toward the rising sun, but the specifics of the orientation are often not known today; there are also notable exceptions, such as the Pantheon which faces north. In ancient Rome only the native deities of Roman mythology had a templum; any equivalent structure for a foreign deity was called a fanum. The Romans usually referred to a holy place of a pagan religion as fanum; in some cases this referred to a sacred grove, in others to a temple. Medieval Latin writers also sometimes used the word templum, previously reserved for temples of the ancient Roman religion. In some cases it is hard to determine whether a temple was a building or an outdoor shrine. For temple buildings of the Vikings, the Old Norse term hof is often used. A Zoroastrian temple may also be called a Dar-e-mehr and a Atashkadeh. A fire temple in Zoroastrianism is the place of worship for Zoroastrians. Zoroastrians revere fire in any form, and their temples contains an eternal flame, with Atash Behram (Fire of Victory) as the highest grade of all, as it combines 16 different types of fire gathered in elaborate rituals. In the Zoroastrian religion, fire (Atar), together with clean water (Aban), are agents of ritual purity. Clean, white "ash for the purification ceremonies is regarded as the basis of ritual life," which, "are essentially the rites proper to the tending of a domestic fire, for the temple fire is that of the hearth fire raised to a new solemnity". Hindu temples are known by many different names, varying on region and language, including Alayam, Mandir, Mandira, Ambalam, Gudi, Kavu, Koil, Kovil, Déul, Raul, Devasthana, Degul, Deva Mandiraya and Devalaya. A Hindu temple is a symbolic house, the seat and dwelling of Hindu gods. 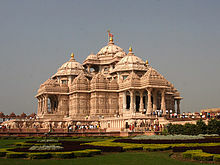 It is a structure designed to bring human beings and gods together according to Hindu faith. Inside its Garbhagriha innermost sanctum, a Hindu temple contains a Murti or Hindu god's image. Hindu temples are large and magnificent with a rich history. There is evidence of use of sacred ground as far back as the Bronze Age and later during the Indus Valley Civilization. Outside of the Indian subcontinent (India, Bangladesh and Nepal), Hindu temples have been built in various countries around the world. Either following the historic diffusion of Hinduism across Asia (e.g. ancient stone temples of Cambodia and Indonesia), or following the migration of the Indian Hindus' diaspora; to Western Europe (esp. Great Britain), North America (the United States and Canada), as well as Australia, Malaysia and Singapore, Mauritius and South Africa. Buddhist temples include the structures called stupa, wat and pagoda in different regions and languages. A Buddhist temple might contain a meditation hall hosting Buddharupa, or the image of Buddha, as the object of concentration and veneration during a meditation. The stupa domed structures are also used in a circumambulation ritual called Pradakshina. Temples in Buddhism represent the pure land or pure environment of a Buddha. Traditional Buddhist temples are designed to inspire inner and outer peace. A Jain temple is the place of worship for Jains, the followers of Jainism. Some famous Jain temples are Shikharji, Palitana Jain Temples, Ranakpur Jain Temple, Shravan Belgola, Dilwara Temples and Lal Mandir. Jain temples are built with various architectural designs. Jain temples in North India are completely different from the Jain temples in South India, which in turn are quite different from Jain temples in West India. Additionally, a Manastambha (meaning column of honor) is a pillar that is often constructed in front of Jain temples. A Sikh temple is called a Gurdwara, literally the doorway to the Guru. Its most essential element is the presence of the Guru, Guru Granth Sahib. The Gurdwara has an entrance from all sides, signifying that they are open to all without any distinction whatsoever. The Gurdwara has a Darbar Sahib where the Guru Granth Sahib is seen and a Langar where people can eat free food. A Gurdwara may also have a library, nursery, and classroom. A Gurdwara can be identified from a distance by tall flagpoles bearing the Nishan Sahib, the Sikh flag. Temple of Kukulcan in Chichen Itza located on top of Kukulcan pyramid. Temples of the Mesoamerican civilization usually took the shape of stepped pyramids with temples or shrines on top of the massive structure. They are more akin to the ziggurats of Mesopotamia than to Egyptian ones. A single or several flight(s) of steep steps from the base lead to the temple that stood on the plateau on top of the pyramid. The stone temple might be a square or a rounded structure with a door opening leading to a cella or inner sanctum. The plateau on top of the pyramid in front of the temple is where the ritualistic sacrifice took place. Some classic Mesoamerican pyramids are adorned with stories about the feathered serpent Quetzalcoatl or Mesoamerican creation myths, written in the form of hieroglyphs on the rises of the steps of the pyramids, on the walls, and on the sculptures contained within. Notable example include Aztec Acatitlan and Mayan Chichen Itza, Uxmal and Tikal. In Judaism, the ancient Hebrew texts refer not to temples, the word having not existed yet, but to a "sanctuary", "palace" or "hall". Each of the two ancient temples in Jerusalem was called in the Tanakh Beit YHWH, which translates literally as "YHWH's House." The Temple Mount in Jerusalem is the site where the First Temple of Solomon and the Second Temple were built. At the center of the structure was the Holy of Holies where only the High Priest could enter. The Temple Mount is now the site of the Islamic edifice, the Dome of the Rock (c. 690). The Greek word synagogue came into use to describe Jewish (and Samaritan) places of worship during Hellenistic times and it, along with the Yiddish term shul, and the original Hebrew term Beit Knesset ("House of meeting") are the terms in most universal usage. Since the 18th Century, Jews in Western and Central Europe began to apply the name "temple", borrowed from the French where it was used to denote all non-Catholic prayerhouses, to synagogues. The term became strongly associated with Reform institutions, in some of which both congregants and outsiders associated it with the elimination of the prayers for the restoration of the Jerusalem Temple, though this was not the original meaning—traditional synagogues named themselves "temple" over a century before the advent of Reform, and many continued to do so after. In American parlance, "temple" is often synonymous with "synagogue", but especially non-Orthodox ones. The word temple is used frequently in the tradition of Eastern Christianity; particularly the Eastern Orthodox Church, where the principal words used for houses of worship are temple and church. The use of the word temple comes from the need to distinguish a building of the church vs. the church seen as the Body of Christ. In the Russian language (similar to other Slavic languages), while the general-purpose word for "church" is tserkov, the term khram (Храм), "temple", is used to refer to the church building as a temple of God (Khram Bozhy). The words "church" and "temple", in this case are interchangeable; however, the term "church" (Ancient Greek: ἐκκλησία) is far more common. The term temple (Ancient Greek: ναός) is also commonly applied to larger churches. Some famous churches which are referred to as temples include the Hagia Sophia, Saint Basil's Cathedral, the Cathedral of Christ the Saviour and the Temple of Saint Sava in Belgrade, Serbia. See also: Orthodox church (building) and catholicon. The word temple has traditionally been rarely used in the English-speaking Western Christian tradition. In Irish, some pre-schism churches use the word teampall. The usual word for church in the Hungarian language is templom, also deriving from the same Latin root. In Spanish, they make a distinction between the temple being the physical building for religious activity, and the church being both the physical building for religious activity and also the congregation of religious followers. Beginning in the late eighteenth century, following the Enlightenment, some Protestant denominations in France and elsewhere began to use the word temple to distinguish these spaces from Catholic churches. Evangelical and other Protestant churches make use of a wide variety of terms to designate their worship spaces, such as church, tabernacle or temple. Additionally some Breakaway Catholic Churches such as the Mariavite Church in Poland have chosen to also designate their central church building as a temple, as in the case of the Temple of Mercy and Charity in Płock. 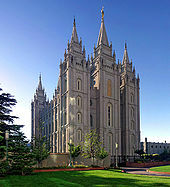 According to Latter Day Saints, in 1832, Joseph Smith received a revelation to restore the practice of temple worship, in a "house of the Lord". The Kirtland Temple was the first temple of the Latter-day Saint movement and the only one completed in Smith's lifetime, although the Nauvoo Temple was partially complete at the time of his death. The schisms stemming from a succession crisis have led to differing views about the role and use of temples between various groups with competing succession claims. The Book of Mormon, which Latter Day Saints believe is a companion book of scripture with the Bible, refers to temple building in the ancient Americas by a group of people called the Nephites. Though Book of Mormon authors are not explicit about the practices in these Nephite temples, they were patterned "after the manner of the temple of Solomon" () and served as gathering places for significant religious and political events (e.g. Mosiah 1-6; 3rd Nephi 11-26). The Church of Jesus Christ of Latter-day Saints is a prolific builder of "Latter-day Saint" or "Mormon" temples. There are 163 dedicated temples (152 currently open; and 11 previously dedicated, but closed for renovation), 11 under construction, and 35 announced (not yet under construction). Latter-day Saint temples are reserved for performing and undertaking only the most holy and sacred of covenants and special of ordinances. They are distinct from meeting houses and chapels where weekly worship services are held. The temples are built and kept under strict sacredness and are not to be defiled. Thus, strict rules apply for entrance, including church membership and regular attendance. During the open-house period after its construction and before the temple is dedicated, the temple is open to the public for tours. Various sects in the Latter Day Saint movement founded by Joseph Smith have temples. The Church of Christ (Wightite), a Latter Day Saint denomination formed by Lyman Wight following the death of Joseph Smith, built first Mormon temple west of the Mississippi in Zodiac, Texas. about three miles from Fredericksburg. In 1990 or earlier a temple in Ozumba, Mexico was built by the Apostolic United Brethren. On April 17, 1994 the Independence Temple in Independence, Missouri was open by the Community of Christ by then-church Prophet-President Wallace B. Smith. 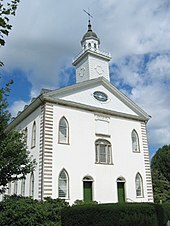 The Community of Christ also currently owns the original Kirtland Temple, dedicated in 1836 by the Church of the Latter Day Saints (later renamed the Church of Jesus Christ of Latter Day Saints), in Kirtland, Ohio. The Community of Christ operates the Kirtland Temple as a historic site. In 2005 construction on the YFZ Ranch Temple by the Fundamentalist Church of Jesus Christ of Latter-Day Saints Church began. It is located just outside Eldorado in Schleicher County, Texas. However, as of April 2014, the State of Texas took physical and legal possession of the property. as it was used to "commit or facilitate certain criminal conduct." A pyramid-shaped temple near Modena, Utah was built by the Righteous Branch of the Church of Jesus Christ of Latter-day Saints. Mount Ecclesia Esoteric Christian Temple of the Rosicrucian Fellowship with its round 12-sided building architecture set on top of a mesa and facing east, the rising Sun. This modern-day temple is ornamented with alchemical and astrological symbols. Freemasonry is a fraternal organization with its origins in the eighteenth century whose membership is held together by a shared set of moral and metaphysical ideals. Freemasons meet as a Lodge. Lodges meet in a Masonic Temple, Masonic Center or a Masonic Hall, such as Freemasons' Hall, London. Some confusion exists as Masons usually refer to a Lodge meeting as being in Lodge. Göbekli Tepe, located in southern Turkey, was built in 8th millennium BCE - 10th millennium BCE. Its circular compounds on top of a tell are composed by massive T-shaped stone pillars decorated with abstract, enigmatic pictograms and animal reliefs. Pashupatinath is one of the most famous temples of Hindu religion, which is located at Kathmandu, Nepal. Bahá'í temple (Mashriqu'l-Adhkárs or ‘Houses of Worship’). Mankhim, the temple of the ethnic group the Rai, located at Aritar, Sikkim. Confucian temple or Temple of Confucius. Shintoist jinja are normally called shrines in English in order to distinguish them from Buddhist temples (-tera, -dera). Taoist temples and monasteries are called guan or daoguan (道观, literally "place of contemplation of the Tao") in Chinese, guan being the shortened version of daoguan. Shrines of the traditional Chinese Ethnic Shenism are called miao, or ancestral hall in English. Joss house is an obsolete American term for such kind of places of worship. ^ Latin Dictionary and Grammar Aid. University of Notre Dame. 26 May 2009. Retrieved 24 July 2009. ^ "New York Buddhist Temple for World Peace". Kadampanewyork.org. 1997-08-01. Archived from the original on 2012-06-11. Retrieved 2012-06-20. ^ Babb, Lawrence, A (1996). Absent lord: ascetics and kings in a Jain ritual culture. Published University of California Press. p. 66. ^ Koontz, Rex (2013). Mexico: From the Olmecs to the Aztecs. New York, New York: Thames and Hudson. ISBN 9780500290767. ^ Michael A. Meyer, Response to Modernity: A History of the Reform Movement in Judaism, Wayne State University Press, 1995. p. 42. ^ Baldayac, Rafael. "Iglesia y templo: diferencia". La Informacion. Retrieved 23 January 2018. ^ "The Second Book of Nephi Chapter 5 - 5:16". Lds.org. 2012-02-21. Retrieved 2012-06-20. ^ "Temples". Achoiceland.com. 2010-10-01. Retrieved 2012-06-20. ^ Utah Attorney General’s Office and Arizona Attorney General’s Office. The Primer, Helping Victims of Domestic Violence and Child Abuse in Polygamous Communities Archived 2013-01-27 at the Wayback Machine. Updated June 2006. Page 23. ^ Johnson, Melvin C. (2006). Polygamy on the Pedernales:Lyman Wight's Mormon Villages in Antebellum Texas, 1845-1858. Logan, Utah: Utah State University Press. p. 125. Retrieved 6 February 2015. ^ "Jeffs dedicates FLDS temple site at YFZ Ranch". The Eldorado Success. January 11, 2005. Archived from the original on March 7, 2005. Retrieved April 6, 2008. ^ "FLDS temple appears complete". Ben Winslow (AP). 31 January 2006. ^ a b "Texas Seizes Polygamist Warren Jeffs' Ranch". NBC News. Associated Press. April 17, 2014. Retrieved April 18, 2014. ^ a b Carlisle, Nate (April 17, 2014). "Texas takes possession of polygamous ranch". The Salt Lake Tribune. Retrieved April 17, 2014. ^ "9 Amazing Nepali Temple You Should Visit Before You Die". Prasant Bhatt. 2018-04-13. Retrieved 2018-04-13.